Delhi woke up on Wednesday to a second day of haze as pollution spiked, hitting 30 times the World Health Organization's safe level, prompting doctors in the national capital to warn of a public health emergency. 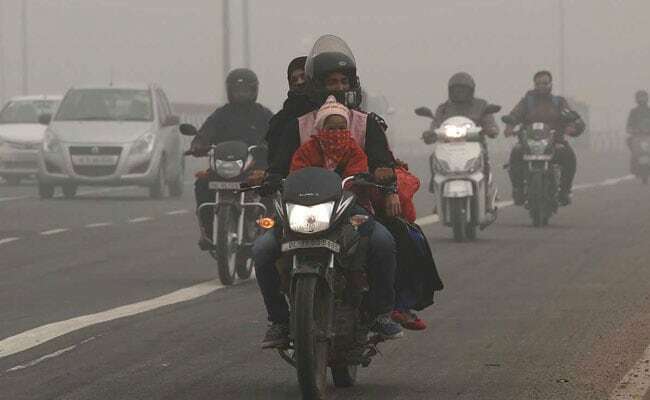 New Delhi: With Delhi turning into a "gas chamber" with thick toxic smog engulfing the national capital and its suburbs for the second straight day on Wednesday, the Aam Aadmi Party government will take a decision today on whether to bring back the odd-even scheme to regulate vehicles on the road in a bid to curb air pollution. A Supreme Court-mandated pollution monitoring body has declared an air pollution emergency in the national capital, pushing the Delhi government to ban entry of trucks and halt all construction activity into the city. Air pollution levels had crossed into the "severe plus", or emergency category and the government would roll out the vehicle rationing scheme if pollution levels persist for 48 hours, Delhi Transport Minister Kailash Gahlot told news agency Press Trust of India. Chief Minister Arvind Kejriwal called Delhi - the world's most polluted capital - a "gas chamber". His government has ordered schools in the city to shut till Sunday. Lieutenant Governor Anil Baijal has announced the restrictions on movement of trucks except those carrying essential commodities. The Delhi Metro has announced a four-fold hike in the rates for parking on its premises to discourage commuters from using private vehicles. It had on Wednesday announced that it would be running more train trips on several routes today onwards to accommodate a larger number of commuters. The Health Ministry on Wednesday issued an advisory, urging residents to use carpooling and public transport, stay indoors, and to not smoke. "Remain indoors if you have breathing difficulty and try to keep children indoors as much as possible. Avoid morning walks or any other strenuous outdoor activity that increases breathing rate," said the advisory. In the afternoon, the level of carcinogenic pollutants in Delhi's air was roughly 10 times that in China's capital Beijing. The day-long average air quality index of the Central Pollution Control Board (CPCB) had a score of 478 on a scale of 500, indicating 'severe' levels of pollution, while many individual stations recorded AQI as high as 487. If the score touches 500 and persists there for at least 48 hours, measures like odd-even and a ban on construction and demolition activities will come into force across the Delhi-NCR under the Graded Response Action Plan (GRAP). Delhi's air quality typically worsens ahead of the onset of winter as cooler air traps pollutants near the ground, preventing them from dispersing into the atmosphere, a phenomenon known as inversion. High levels of moisture in the air and a lack of wind mean emissions have been trapped in the environment, according to the Central Pollution Control Board. Firecrackers set off to celebrate Diwali last month added to the toxic mix created by pollution from diesel engines, coal-fired power plants and industrial emissions. The problem has been further exacerbated by the burning of crop stubble by farmers after the harvest in neighbouring states, a practice that remains commonplace despite an official ban.